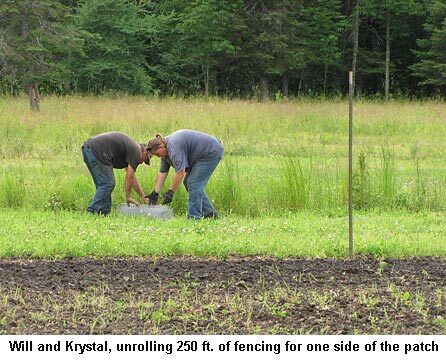 Will, Krystal, and I finished hanging the last two sections of the 6-foot-high fencing on the new pumpkin/corn patch. We had decided to wait for a more doable cash flow but the deer were starting to eat, not nibble, on plants in there, including many of our pumpkin vine leaves. If we were going to get a decent crop, we had to do something. So we bit the bullet and bought the rest of the fence. It’s all up now and that was a job well done! The plants can grow without harm. 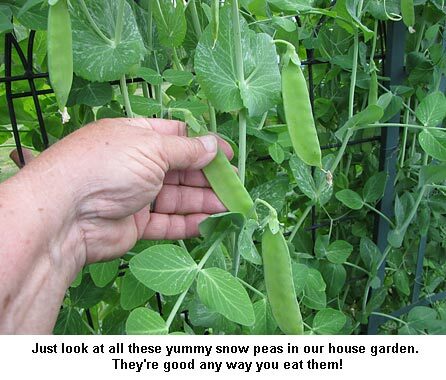 Our garden is doing great! We’ve been eating snow peas, broccoli, and asparagus right along and the first of Will’s Hungarian Wax (Hot Banana) peppers are ready to use. I’ll be putting up a whole lot of his favorite hot pepper rings soon. And the rest of the peppers are following to suit. Boy, there are a lot of baby peppers in that big hoop house! It was supposed to be rain-free until Friday, so Will cut two hayfields. Last night we got a little rain and today it’s sprinkling on and off. Yikes! I hope it doesn’t pour! And I hope we get some sunshine to get that hay dry! I think that Krystal has been a blessing and has been blessed, too. She is one hard working lady, and to think of all the knowledge she is gaining this summer to help her along her own life path, it’s been wonderful to watch from afar. Please let her know how nice it has been to watch her progress and see her willingness to tackle everything side by side with you and Will, through your pictures. Dad and I are still inching our way through our freezers, still canning meat and making what I call pop top meals – the soups, and chili’s and such – making life easier for us at meal times. He’s grateful as mom’s abilities have been steadily decreasing. But it’s also FUN! for both of us. Sharing time and passing on stories of times past has been great. My family lore journals just keep growing along with the canned goods, lol. I was proud to hear that Will’s health hasn’t deteriorated, and my prayers are for more good check-ups in the future. I hope you are doing well, TOO. Thank you for the prayers for my granddaughter. She has made it through the first round of chemo, and we are awaiting the results. She is one strong young lady. The deer are monsters – that fence looks great. 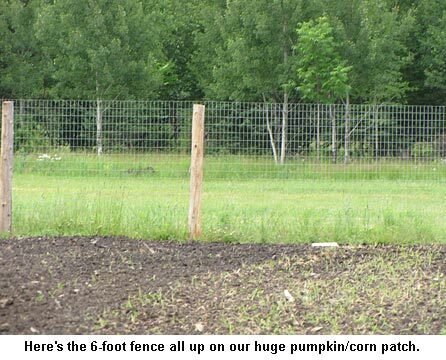 I don’t know if even a fence could contain our Seminole pumpkin and calabaza vines this year. I’m hoping to get in a round of peppers this fall. Keep it up with the great photos! I keep thinking what a blessing Krystal has been to you guys this summer.